(Trent Nelson | The Salt Lake Tribune) When the Utah Legislature did away with the state's unique dining club designation, business owners had to decide whether to become a bar or a restaurant. 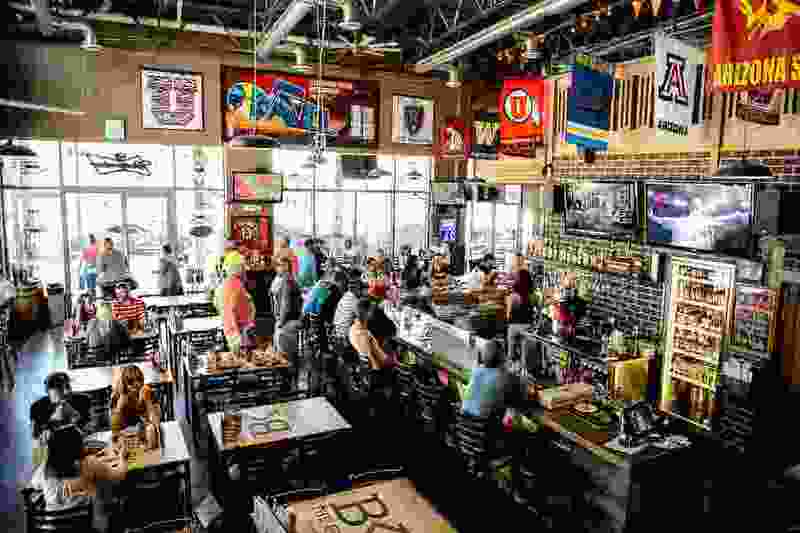 The Break Sports Grill in South Jordan is one of 47 businesses that decided to become bars. Did you know that Utah has more than 1,800 business that serve alcohol — from bars, beer halls and restaurants to bowling alleys, golf courses and event centers? That should shatter the popular stereotype that you can’t get a drink in Utah. Right? You see, when it comes to alcohol in Utah, there are haves and have-nots. Count Salt Lake County among the haves. The state’s most populous county has 861 alcohol licenses, according to the Utah Department of Alcoholic Beverage Control (DABC). Conversely, tiny Sanpete County has just two licenses — one for a bar in Mount Pleasant and the other for beer at a bowling alley in Ephraim. The state boasts more than 350 bars, and Salt Lake County accounts for over half. Five counties (we’ll tell you which ones later) have none. So, let’s dive deeper into the DABC data. Whether you drink or not, there’s a lot to learn — and, for private and public coffers, to earn (sales topped $454 million last fiscal year) — about the state of alcohol in the Beehive. It’s easy to find a bar in Salt Lake County • Wine, beer and spirits flow freely in a county with more than 1.1 million residents. The county has 192 bars, or about one for every 6,000 residents. Of course, bars are just one type of business where liquor is available. In all, the DABC has granted 861 alcohol licenses to restaurants, bowling alleys, golf courses, event centers, hotels, even the Salt Lake City International Airport. Five counties don’t have a bar • Daggett, Piute, Rich and Wayne counties — four of the state’s least-populated regions — do not have a single watering hole, although there are restaurants where you can order an alcoholic beverage as long as you order food. Additionally, Morgan County doesn’t have a bar. It does have a beer-only tavern called Kelly’s Roadhouse #2, a favorite biker hangout known for its garlic burgers. A second tavern, called the Stoddard Inn, is expected to open soon. Seven counties have just one bar • Sanpete County is almost bone dry, save for Stanley’s Triangle Lounge in Mount Pleasant. It’s one of seven Utah counties that have one bar. Other one-bar counties: Emery (Chick’s Rock 'N Roost, Castle Dale), Juab (Salt Creek Sports Lounge, Nephi), Kane (Amangiri Resort, outside Kanab), Millard (Curley’s Lounge, Delta), San Juan (Granary Bar & Grill, Monticello) and Sevier (Cove Eats & Drinks, Richfield). It’s difficult to find a bar in Utah County • With a population of more than 606,000, it is easily the state’s second most populous county. But it has just 14 bars. That’s about one for every 43,000 residents. Strange, perhaps, until you consider that 80 percent of the residents are members of The Church of Jesus Christ of Latter-day Saints, which teaches them to eschew alcohol, and that the county is home to church-owned Brigham Young University. There are 112 other businesses — mostly restaurants — where consumers can get beer, wine or spirits as long as they order food. Two years ago, the county’s first brewery since Prohibition — Strap Tank Brewing — opened in Springville. The number of bars in Utah is tied to population • As the state grows, so does the number of available liquor licenses. Under state law, Utah can have one bar for every 10,200 residents. With a population of 3.1 million people, that equals 300-plus bars. Before July 1 of this year, the ratio was one bar for every 7,850 residents. The Legislature adjusted the ratio in 2017, when — among other alcohol changes — it eliminated dining clubs. Businesses that held the dining club license had to decide by July 1 whether they wanted to become a bar or restaurant. Dining clubs are dead • Of the 77 businesses with Utah dining club licenses, 47 became bars, according to the DABC. That pushed the total tally of bars in Utah to more than 359 — thus the need to alter the state ratio (see above). Customers most affected by the change are families who no longer can take their minor children with them into these new 21-and-older establishments, and owners of the businesses that chose to become restaurants. They now are required to have a 10-foot buffer between the liquor-dispensing area and the seating area or build the 7-foot “Zion Curtain.” Both measures are intended to keep minors separated from the mixing and pouring of alcoholic drinks. The waiting list to get a bar license is gone • While it might seem that increasing the population ratio would have created a shortage of bar licenses, initially the opposite seems to be occurring. There currently are three bar licenses available for business owners who met the state liquor license requirements. “It seems high,” Salt Lake City attorney Tanner Lenart said of the new ratio, “but given how many bar licenses are available right now, it hasn’t had a negative effect on new business.” That’s a shift from a few years ago, when businesses waited sometimes as long as a year to get a bar license. Various liquor law changes, including the ability to buy and transfer liquor licenses, have helped reduce the demand. It costs a lot of money — and time — to open a bar • To get a bar license, an owner must pay a $2,750 license fee and a $300 nonrefundable application fee to the DABC. Owners must pay for a business license from the city their bars are in, get a background check, post a $10,000 bond and purchase “dramshop” insurance for a minimum of $1 million per instance of intoxication-involved liability and $2 million total. Bar owners also are required to submit to the DABC a floor plan that highlights where alcohol will be stored, sold and consumed; menus for the food and alcohol to be served; as well as alcohol-training plans for employees and managers. Signs that read “This Is a Bar” still exist • A Utah bar still must display a sign 8.5 inches long and 11 inches wide indicating that the premise is “A BAR” and that “NO ONE UNDER 21 IS ALLOWED.” It must be posted in a conspicuous place at the entrance. (Steve Griffin | The Salt Lake Tribune) Recent changes to state law allow Utah restaurants that serve alcohol to take down their "This is a restaurant, not a bar" signs. But every bar must still post the sign letting customers know it's a 21-and-older establishment. There are nine “dry” cities in Utah • Statewide, there are nine cities where you can’t buy booze, including Highland, in Utah County; Holden and Scipio, in Millard County; Aurora, in Sevier County; and Hatch, in Garfield County, according to statistics from the Utah Beer Wholesalers Association. San Juan County also has four dry towns, including Aneth and Navajo Mountain, within the Navajo Reservation; White Mesa on the Ute Reservation; and Blanding. The latter town’s voters rejected a proposal to allow beer and wine sales last November. Taverns are bars that serve only beer • A “tavern” is the official DABC term for a beer bar, and there are 22 in Utah, with two more expected to open soon. These 21-and-older establishments can sell beer, but not wine, liquor or flavored malt beverages. Customers also do not have to order food — as they do in restaurants. Many Utah breweries that advertise a taproom have the tavern license. The state’s oldest tavern is 139 years old • The Weber County town of Huntsville is home to Utah’s oldest tavern — the Shooting Star Saloon, operating since 1879. Some people believe it may be the oldest continuously operating beer joint west of the Mississippi. It’s popular with motorcycle riders in the summer and skiers in the winter; many patrons visit to savor the signature Star Burger, made from two ground-beef patties and cheese with a grilled knackwurst Polish sausage in the middle. Then they raise an ice cold mug of Blue Moon Ale and thank the heavens they can enjoy a drink in Utah.